After a long day of exploring the magnificent city of Prague, the best thing to do is settle down with a drink in hand and watch the city wind down as the sun slowly falls below the horizon. No matter where you are in the Czech Republic’s capital, you will always have beautiful views, but not all of them will allow you to see the sunset. Rooftop bars and viewpoints give you the opportunity to see the city fall asleep to the melodic colors of the sky, but not without a pretty price tag. There are, however, multiple places in Prague where you can grab great food while watching the setting sun for a reasonable price. Head to these four places to end the stress of a tiring week, or to simply enjoy the beautiful views of the most underrated city in Europe. Located a short walk from Jiřího z Poděbrad, Riegrovy Sady is a beautiful, winding park with multiple restaurants and a beer garden. This park is welcoming for every time of person; families with little children, wild, loud sports fans, or people just looking to relax. With Zemský Pivovar on tap, Riegrovy Sady Beer Garden is one of the few outdoor drinking spaces that serves a microbrew. They also serve typical Czech beers, like Pilsner or Gambrinus, wine, cocktails, and a variety of food from the grill. When the weather is nice, the beer gardens are usually packed with crazed sports fans watching the games on the large screens, so if you are looking for a relaxing place to unwind, this is not the place. About a five minute walk away from the beer gardens is Mlíkárna, a cosy cafe with outdoor and rooftop seating, drinks and grilled food. Both the beer gardens and Mlíkárna have a take away option for beer, which is what many people do because just a minute walk away from the Prague Castle. During the warm season this sloped lawn is barely visible because it’s covered in a vivid tapestry of blankets and people. The Riegrovy Sady sunset hill, as my friends and I call it, represents a community of all kinds of people coming together to enjoy the tranquility of the setting sun. With beers and food from the nearby restaurants, a blanket to sit on, and a community of friends, ending the day here is pure bliss. If you’re a foodie or beer snob, Náplavka is the place for you. 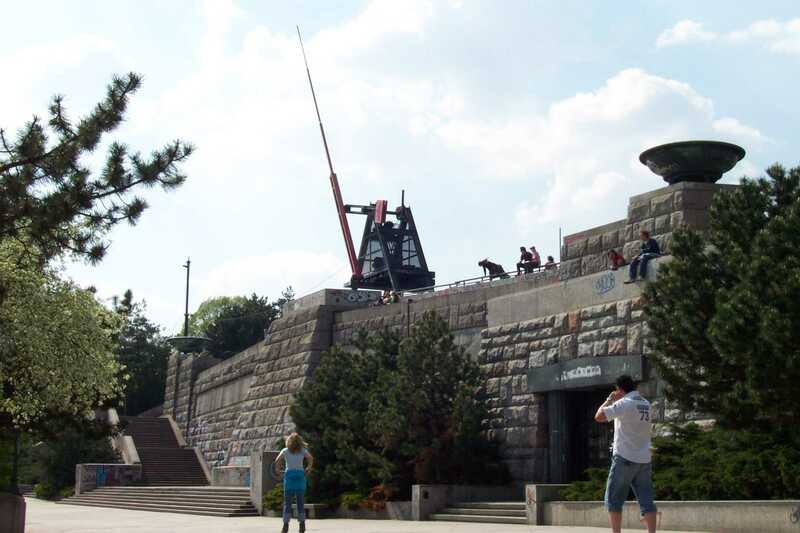 Náplavka, literally meaning “on the embankment” in Czech, is located just north of Vyšehrad on the riverside. On Saturday this place is a bustling farmers market. Whenever the weather permits, Náplavka holds events the trickle into the night, including food truck festivals, beer festivals, and live music events. The Náplavka crowd tends to be younger and therefore many of the events are geared towards millennial and alternative people of Prague. Whether there is an event or not, this riverside is always a great place to view the sunset. When the food trucks are gone, you can enjoy a juicy burger and a drink on one of the multiple boats that are docked there. On any given day, Náplavka is a great place to visit, but for a truly magical experience try dangling your feet over the water, sipping on some wine, while watching the pinks and oranges of the sky fade away. From 1955 to 1962, the world’s largest statue of Joseph Stalin towered over the city where the Metronome now stands. Despite being 50 years since this statue was demolished, this popular area is known to any local as “Stalin.” During the summer, Stalin has events almost every night, such as movie nights, concerts, and theatrical performances,. The best part of it is that it’s all free! All that’s necessary to buy is the beer, Károba 11°,that is made exclusively for this beer garden. With shoes hanging from the power line above your head and skate boarders gliding around at all times of the day, you will find an amazing outlook of Prague with views of the many spires of Prague, the Petrin Tower, and even parts of the castle. Grab a beer in one of Stalin’s iconic reusable cups, and go up to the metronome to dangle your feet over the city as the sun sets. Vyšehrad towers above the city, providing views of most of the iconic buildings in Prague. At sunset, the Vltava river creates the perfect canvas for the sunsets to reflect off of. Although it is quite a hike to get up there, the panoramic views more than make up for it. 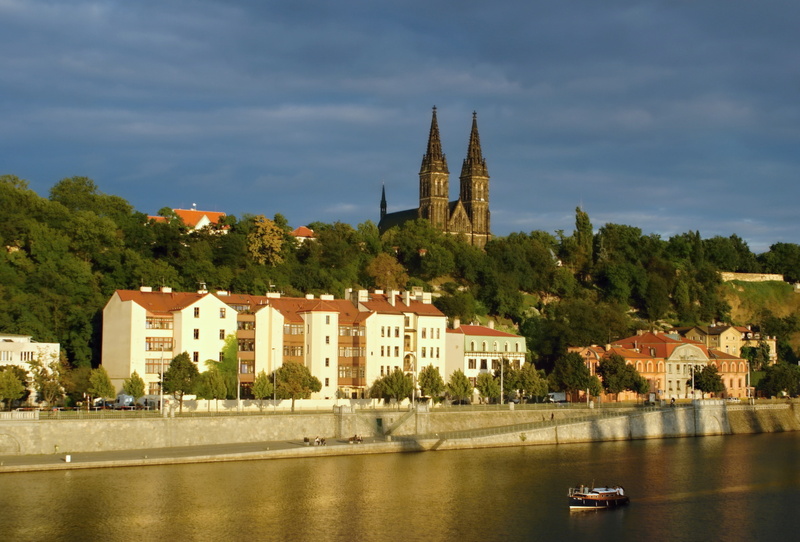 Unlike the other locations, Vyšehrad is usually a quiet and peaceful place at all times of the day. It’s home to the most famous cemetery in Prague, where many famous Czechs are buried, and the beautiful Saint Peter and Paul Basilica. 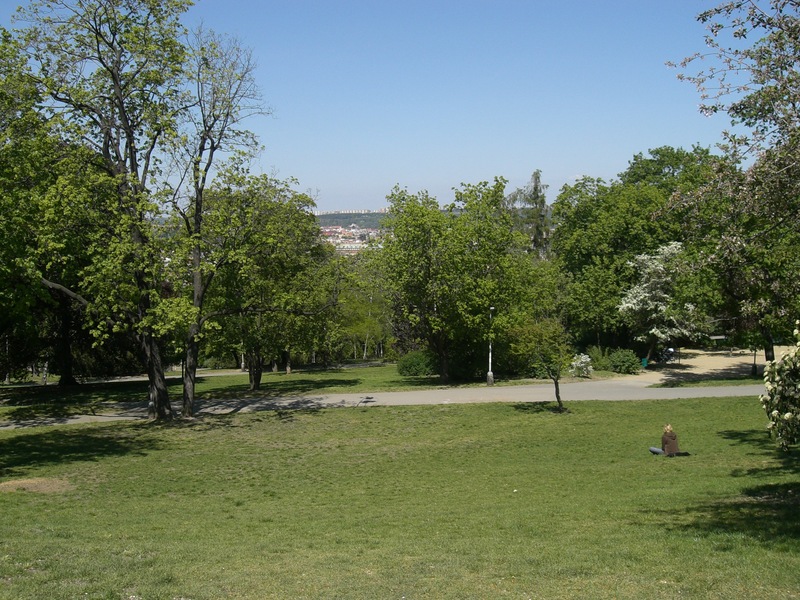 A walk around the park with a drink in hand from either Café Citadela Vyšehrad or Hospůdka Na Hradbách is a peaceful and relaxing way to unwind from the events of the day, and a great way to see the city from a different perspective. The best views aren’t at either of these restaurants though, but rather right outside of the Galerie Vyšehrad. Luckily both places have drinks to go, so you can either grab one for there and enjoy the nice atmosphere or take one with you to watch the city slowly fall asleep.